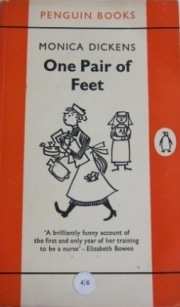 This is a 1952 book which looks back on the wartime year of a young woman who decides to train as a nurse to help the war effort. She does not need the money; she is not forced into the hospital by conscription, she “could not make up her mind what to be”. She finds many snags to each of the choices, A.T.S. requiring little work, the W.V.S involves ungrateful evacuees and the Land Army requires mangel- wurzel pulling in the early morning. The idea of nursing “Had always attracted me.” and she embarks on a journey to a hospital, any hospital who will allow her to start training immediately. For those who may not relish the idea of a medical memoir, the writer is far more interested in her situation in the new way of life she discovers at the hospital. 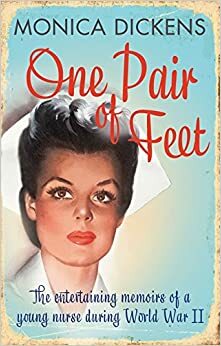 The other nurses of all ranks are discussed as some eat their body weight, others fall in love with local servicemen, some are determined to run the hospital on strict lines, or at least whichever ward Dickens is sent to in a haphazard way. She works nights, fails to sleep during the day, and is occasionally invited away from the hospital for social engagements. One of the funniest situations is when she visits a school and is hailed as a source of a diagnosis of an odd rash. It is a funny book, despite or perhaps because of its setting. She assists at the last minute saving of a woman, and nurses private patients with their many and various requirements. There is a moment when the war seems about to intrude with extra patients, but as in many cases it is an anti climax, as is well suggested in the build up to the anecdote. This is a well written, amusing book full of tales which have the suggestion of truth. It is not a sentimental tale, but more in the spirit of “The Diary of a Provincial Lady” which is high praise. As a tale of the Home Front it is almost modern in its humour, and is far from a grim recall of danger survived. Dickens emerges as an independent young woman with a keen flair for honest observation. It is of its time, but is well written and engaging, and given its subject matter, a surprisingly cheerful read. I found it a fascinating picture of war time life, cheerful in contrast with other books of the time, and can recommend it to anyone interested in the life actually lived by some of the people of Britain at a time of challenge. 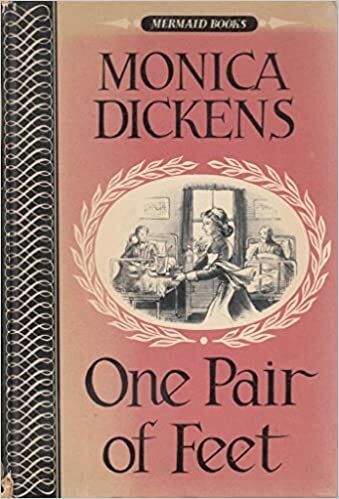 Monica Dickens is a popular author for those who enjoy mid twentieth century British Women writers, especially as many of her books were autobiographical. 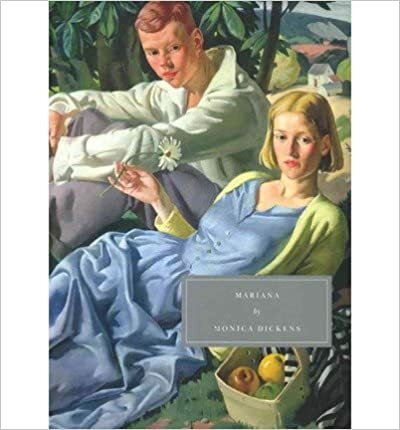 It is no wonder then, that Mariana was the second book published by Persephone, and reprinted in their “Classics” series. The date of original publication, 1940, may suggest war time novels, but much of this book is pre war, the story of a girl growing up and meeting the challenge of what seems like an intensely felt life. The beginning and end of this novel are set in the early part of the war, with all the heightened emotions and appreciation of danger, but this is essentially the story of a girl, a young woman, finding life and love. The first element of the novel may strike a chord with anyone who spent childhood holidays in the same place, with the same people. “Mary” is the main character of these reminiscences; we see her experiencing childhood adventures and the first stirrings of romance with a relative, Denys, enjoying the predictable pleasures of childhood. An only child, she lives with her mother and actor uncle in a small London apartment and finds school challenging. This is no misery memoir as her decision to go to drama school is described in all possible detail, a very funny account of her struggles to conform to the idiosyncratic demands of the course, and the glorious final performance which distinguishes her career as a would be actress. Throughout her life her mother is a permanent if fascinating character, allowing much experimentation in the face of her own romantic confusion and business endeavours. When Mary goes to Paris and gets engaged in a set piece of scenery and charm, her mother is accepting as always, being secretly perceptive to what her daughter actually wants from life. Marriage is seen as important, not just to be drifted into, even if it brings the potential for pain. This is a gentle book about how women had choices in the interwar period that their mothers lacked. It is a funny and entertaining book, with characters who could be real, living in circumstances not all of their choosing, but making the best of things in this time. The style is friendly, with no great melodrama but understandable emotions. I can recommend it for those who are keen on “middlebrow” novels, and I am glad that Persephone have kept this particular Dickens book in print.